Some of the most heart wrenching stories are those of a missing child. _In Canada, an average of 60,000 children are reported missing per year, which is about the entire population of the Central Kootenay region. 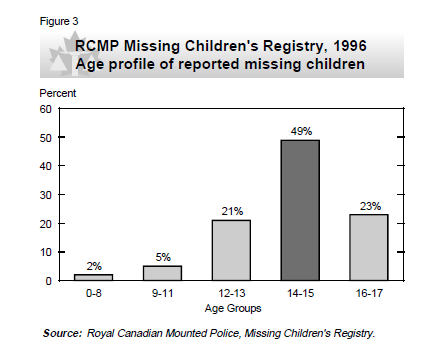 These statistics reflect only those under 18 who have been reported missing to the police. Most missing children are reported as runaways, unknown or parental abduction. A very small amount are because the child is abducted by a stranger, the child just wandered off, or another reason. When reading these statistics, please remember that not all of these children are still missing. The amounts reflect how many reports were filed. Most children are often found within 72 hours. 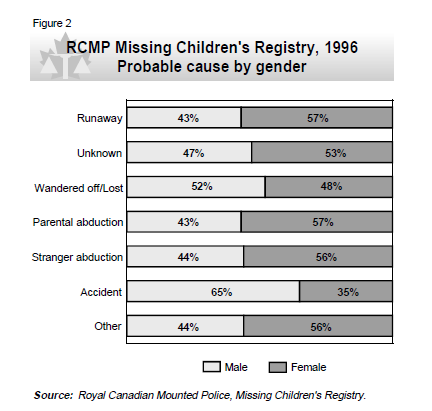 In 1996, the RCMP Missing Children's Registry did a study to see the cause of a child being reported missing, a gender profile, and an age profile of the missing children. The evidence is shown in tables below.